A cruise to Aruba can be an amazing experience. 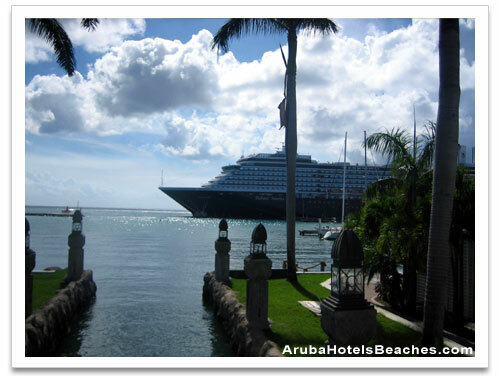 Aruba is a popular port of call on many cruise ships’ itineraries to the southern Caribbean. On the southwestern end of the island is The Port of Oranjestad, which has 5 cruise births. The Aruba Ports Authority has its own security guards which patrols the harbor 7 days a week, 24 hrs. a day. If you are concerned about the safety of the island, don’t be! Aruba is probably the safest island you will ever set foot upon. The people are warm, friendly, and willing to help you in any way they can. Use your common sense about safety just as if you would in your own home town. Information about Aruba can be obtained from the information center inside the air conditioned cruise terminal. Workers from the Aruba Tourist Bureau are there to assist you. You will find an activities desk, booths selling souvenirs, and an array of Caribbean crafts. There is much to do on the island of Aruba. Passengers who cruise to Aruba can choose to take a Bus tour or a Jeep tour, with a tourist guide, or tour the island by renting a car, taking public buses or taxi service. While on the island you must visit some of the most exquisite beaches in the world. There are many Aruba beaches to choose from depending on what you want to do. You can snorkel, go scuba diving, windsurf, parasail, jet ski or even try your skill at kite boarding. You can go on a deep-sea fishing excursion, a jeep safari tour, sail on a luxury catamaran or go horseback riding along the beach. There are many water sport concessions along Palm and Eagle Beaches. Maybe you would love to just relax and sunbathe on a beautiful soft powder white sandy beach. Feel the warmth of the sun on your skin, while watching the gorgeous blue green colors of the ocean as you sip your frosty tropical drink! You can catch a bus by taking a 3 minute walk to the main bus terminal, rent a car or take a taxi. You can choose to see Palm Beach which is where all the high rise resorts are, or visit the low rise resorts on the less crowded Eagle Beach, Manchebo Beach, or Druif Beach. If you are looking to go snorkeling, I suggest Malmok Beach. If you are looking to do some shopping, you are only a 5 minute walk away from the main shopping areas of Oranjestad. You will quickly notice the Dutch Caribbean façade at the Royal Plaza Mall, the cleanliness of the town, and the friendliness of the local people. You can find whatever you are looking for at the Seaport Mall, the Seaport Marketplace, Royal Plaza Mall, Alhambra Shopping Bazaar, Aventura Mall, Sun Plaza Mall, and Main Street Oranjestad. You might want to try the Renaissance Mall if you are looking for international luxury retailers. You will find a maze of jewelry stores filled with gold, silver, diamonds, and precious gemstones. The stores are stocked with perfumes, linens, watches, cameras, pocketbooks, beach wear, cosmetics, designer fashions, shoes, leather goods, electronics, crystal and china. You will also find a variety of local hand crafted items at the many concession stands along the harbor for bargain prices, as well as tee shirts and souvenirs. If you cruise to Aruba you will need to take a bus, or taxi to go to the Palm Beach area for more shopping at the newly constructed multi-level Palm Beach Plaza shopping mall. This mall has a food court, a children’s train, movie theater, rock climbing wall, and a variety of shops. There is The Village Mall across from the Radisson Aruba Resort Casino & Spa, and the Paseo Herencia Mall, also in the Palm Beach area. This mall entertains you with liquid fireworks and live music. Even if you are not a shopper, you will enjoy the Aruban ambiance and the tasty food. If you cruise to Aruba you will only have a small amount of time to enjoy everything the island has to offer. You really need to return to the island on your next vacation and stay for a longer period of time if you want to truly understand why people love the island of Aruba. Click to read about the Aruba Activities that are on the island. Click to read our Aruba nightlife page.